"What did the Founding Fathers sound like?" Plenty of Americans have Googled this question, and there have been more than a few attempts to explain what they sounded like to a general audience. However, these articles are usually of limited scope, pointing out only a handful of features, such as that Colonial English pronounced all its "r"s and therefore it sounded more like American English than British English. I can't blame them for not going more into detail. After all, Colonial English is more than two-hundred years old, and it's hard to document all of that when you have a strict deadline and word count. 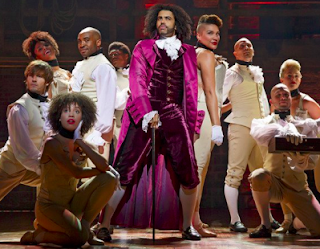 Listening to "Hamilton" and "1776," I found myself wondering - what did the Founding Fathers sound like? Much to my surprise, it's very difficult to find anything on the English of the 18th century! Perhaps it's because all the dramatic changes already happened around two centuries earlier and the modern dialectal changes only really become traceable a century afterward (Beal 2002). Due to my difficulty finding a straightforward explanation of Colonial American English, I conducted some research and gathered it all together here for your reading pleasure. As far as I am aware, this is the only non-paywalled article that discusses Colonial American English in depth and with a general audience in mind. The way this article is organized is as follows: I will describe a difference between Colonial American English (CE) and Modern General American English (GA). I will then either show you an example (if available) or give you a citation. 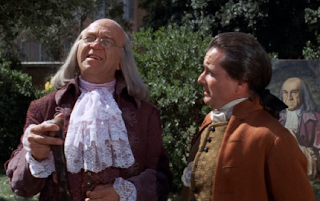 The examples come from Benjamin Franklin, Thomas Jefferson, John Adams, Alexander Hamilton, and (in exactly one instance) John Jay - these men are commonly considered to be "The Founding Fathers" of the United States. An example from the poet Phyllis Wheatley is also used as a supplement. All the citations in parentheses can be found in full at the bottom of the article; links to the texts have been provided where possible. Benjamin Franklin's phonetic alphabet is one of the most important sources used here. Dissatisfied with the discrepancy between English spelling and pronunciation, he came up with a spelling - or orthography - that purported to represent speech as accurately as possible. There are no silent letters. New symbols were added for sounds. The values of old letters were changed. Some letters were removed altogether! His orthography is thus more predictable compared to our orthography. In his writings, he both described the value of each letter and gave samples of writing in the alphabet; this includes poetry and a letter exchange between him and a pupil of his. There are some minor inconsistencies between the poems and the letter exchange, but for the most part the alphabet is consistent. His alphabet was not used outside of his own writings. When quoting Franklin's writings in the phonetic alphabet, I will put his phonetic alphabet on the left and the modern orthography on the right. Note that I did not describe every possible difference here. English in the 1700s was very diverse, and I am presenting a simplified picture here when the truth is that there were likely multiple competing forms at a time! Moreover, there are so many differences between Colonial American English and modern General American that this could easily become a fifteen page document if I described each and every one. This is not intended to be the most comprehensive source on Colonial American English - such a project would be beyond the scope of this blog and would require years of research, and this post has already been more than a year in the making! Instead, consider this a sampler, strongly influenced by Benjamin Franklin, of what a speaker of English might have sounded like had they lived in Colonial America from 1700 to 1750. Let's start with something simple - consonants. One of the remarkable traits about English is that the consonant inventory does not seem to have changed radically over time. Words may change, and vowels certainly will, but the actual list of consonants is not dramatically different between dialects, or even over time. Overall, the consonant inventory of Colonial American English is not too different from the consonant inventory of modern American English. Some of the more notable differences are elaborated on below. Notice that Benjamin Franklin's Phonetic Alphabet gives different transcriptions for "when" and "with". "When" is "hwen", which suggests that 'wh' was still preserved. T-flapping (pronouncing the "t" in words like "kitty" as a flap sound, [ɾ]), does not appear to have started yet. This one is more proof by absence of evidence, as none of the contemporary sources of the 18th century I found described t-flapping. By the early 20th century we already have t-flapping in American English, so it must have been present during the 19th century, but I have not found any evidence that t-flapping happened in Colonial American English. Wells implies that t-flapping is a post-1750 phenomenon, saying that up until 1750, American and British English were more or less similar, and that after that point began the now-distinctive differences between the two to develop. He lists “Tapping and T Voicing” under “Some American innovations” and after “The Great Divide” (1982). The 'r' sound is contentious. Benjamin Franklin describes the 'r' as alveolar and “vibrating”. Unlike New York English and most Southern England varieties, Colonial American English was generally rhotic - 'r's after vowels were pronounced (though see the “Regional Variations” section below to see how non-rhotic varieties existed even then). However, we don't know what this post-vocalic 'r' sounded like. In General American today, 'r' after a vowel is an r-colored vowel, but in Scottish English, it's a flap or a trill. It's possible the sound was in transition so that you would have heard both. Words like 'due' (/dju/), 'Tuesday' (/tjuzdeɪ/), and 'new' (/nju/) used to be pronounced with a 'y' sound, or "yod." Most American dialects nowadays pronounce these words without the yod, resulting in "do" /du/, "toosday" /tuzdeɪ/, and "noo" /nu/ (Krapp 155). 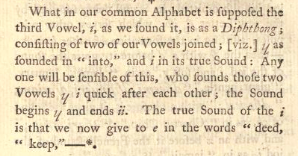 Curiously, Benjamin Franklin's transcription of 'new' would be pronounced "noo" [nu], showing that the loss of this 'y' sound was already beginning. And e nu hev’n in its feer Bɥzɥm իoz. And a new heaven in its fair bosom shows. Now it's getting interesting. Whereas the consonants remained mostly similar, the vowels changed quite a bit compared to General American. Vowels have been prone to mutation throughout the history of the English language, and it's no surprise to see that modern American vowels have gone through a lot of change from their colonial forebears. A lot of the differences between vowels aren't just a matter of substitution - some vowels are simply missing compared to General American, and some words had different vowels in them that Americans don't really distinguish today. Here are some further comparisons of Colonial English (CE) vowels with British Received Pronunciation (RP) and General American (GA). The word on the left is an example word, and the sounds say the vowel that will be used in the word depending on the dialect. All information here is supplemented by the evolution of English vowels throughout English language history. The vowels in "day" ([deɪ]) and "doe" ([doʊ]) are diphthongs in General American - they are composed of two sounds, gliding smoothly from the first to the second. This was not so in Colonial English, where these were "pure" vowels, or monophthongs (Beal 2002:97). To get the impression, imagine that the final element of the diphthongs in "day" and "doe" were chopped off. This would give us [de] and [do]. .
o – the first vowel naturally, and deepest sound; requires only to open the mouth, and breathe through it. a – the next, a little more. e – The next requires the Tongue to be a little more elevated. In modern American English, words like "lot," "cot," "odd," "Ron," "bother," etc. have the same vowel as words like "spa," "palm," and "father:" /ɑ/ . This was not the case in Colonial American English, where words like "lot," "cot," "odd," etc. had a vowel that was made with rounded lips: /ɒ/. To try making it yourself, keep your lips round while saying 'spa'. Words in the second set, such as "spa," "palm," "father", etc. had a different vowel entirely. This means 'father' and 'bother' wouldn't have rhymed! Most dialects of England still preserve this distinction, while old Boston and very old New York dialects are the only American dialects that pronounce them differently. Krapp (141:144) suggests that turning /ɒ/ into /ɑ/, a process called LOT-unrounding, had already begun by the 18th century, though it was not common and was prescribed against. Webster says “a in fall has its short sound in folly." So what sound did they use in the second set of words above? The broad 'ah' /ɑ/ sound in words like "spa," "palm," "father", etc. does not appear to have existed yet (Grandgent 1899)! Franklin does not dedicate a sound to it in his alphabet, and uses the same symbol for "arm" that he does for "hat." This suggests that all these words had /æ/. This means "arm" would have sounded like [ærm] or [arm] (Krapp :50). Krapp notes that the broad 'ah' /ɑ/ sound was coming into existence and possibly existed as a variant at the time. This means that 'palm' and 'Pam' would have sounded the same in Colonial American English. 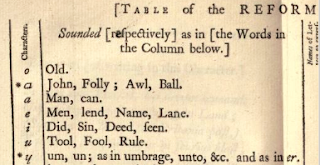 By the mid 1700s, the /ɑ/ vowels appears to have finally appeared (Grandgent 1899, Wells 1982). Kalm and siriin hi drɥivs ˇⱨi feuriիs blast; Calm and serene he drives the furious blast. Notice how Franklin uses same vowel for "calm" and "blast." But when my angel’s in my arms. The "i" /aɪ/ sound as in "kite" had a lower starting vowel; Franklin equates it with the vowel in "about." It likely sounded like [əi]. Krapp suggests that there may have been some variability, so that there were some people saying [ai], some saying [ʌi], and some [ɑi] (p189). The last part of the diphthong was also higher than it is today. The colonial realization of this sound was closer to the sound that Shakespeare would have used. Benjamin Franklin describes that the sound of “i” is actually a diphthong made of the sound he dedicates to ‘uh’ and ‘ee’, so ‘uh-ee’. Notice the same symbol used for "some" and "rising." 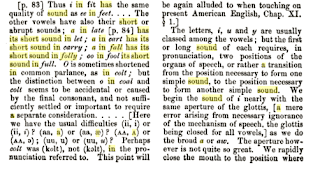 The 'au' /aʊ/ sound in 'bout' was formed further back in the mouth compared to today. Franklin uses the symbol that represents either /ɒ/ or /ɔ/ for it, meaning it may have sounded like /ɔu/. This means that 'bout' would have sounded a lot like General American 'boat'. The /ɔ/ vowel is used for "foul," "flour," "border," and "always." Krapp (p197) suggests that the /ɔɪ/ vowel of "choice" was not yet its own distinct category, and would have sounded the same as the vowel of "price," /əi/ . This means "line" and "loin" would both be something like [ləin]. Franklin does not mention the diphthong that today is /ɔɪ/ in his sounds. Many of the examples shown above give the impression that colonial English was straightforward, but Eighteenth century English was wildly diverse. This can be seen in the fact that I did not assign a single value for the vowel in words like SQUARE /skwɛr/. What is now the modern SQUARE /ɛr/ vowel seems to have been in quite a bit of flux, and could have had a higher realization as /er/ (Krapp:106-107). Franklin does not describe this vowel, although he does provide a transcription for the word "fair" below. And e nu hev’n in its feer Bɥzɥm իoz. And a new heav'n in its fair bosom shows. Franklin uses in his phonetic spelling, the same value he uses for the vowel of “stains”. This would suggest [er]. This is backed by Wells’s suggestion that the SQUARE vowel of English in both America and Britain was /er/ in 1750 (1982:212). Note, however, that we have "air" and "war" rhyming in Phyllis Whealey's poem. "tears" and "cares" can be found rhyming in Thomas Jefferson's poem. More information on this pronunciation of SQUARE set words can be found in "Regional Variations." Where high unfurl’d the ensign waves in air [ær]. Life's visions are vanished, it's dreams are no more. Most dialects of General American pronounce words such as "marry," "carrot," and "carriage" with the same vowel sound as in "merry" and "Kerry" - /ɛr/. In Colonial English, "marry," "carrot," "carriage" etc. would have had a different sound: the 'aa' vowel of 'cat'. Observe how Franklin uses the <a> for "carriages [kærɪdɪʒ]. Words like 'horse' and 'hoarse' were distinct. 'horse' had a /ɔr/ sound, while 'hoarse' would have had a /or/ sound like in "oh" (Wells 1982:212). Nowadays this distinction is almost extinct in General American. "course" with the mid-height vowel , "perform" with low height . Nowadays, the final vowel in words like 'happy', 'baby', 'coffee,' etc. is pronounced with the same vowel as in fleece: [i]. In Colonial English, the final vowel in words like 'happy', 'baby', 'coffee', etc. is pronounced with the same vowel as in kit: [ɪ] (Wells 1982:165). Conservative varieties of Received Pronunciation and Southern American English still use this latter pronunciation. This phenomenon is also discussed in my article Oh Babih, Babay. When you put all these changes together, the end result sounds a lot like how Shakespearean English does when pronounced! It also bears some resemblance to modern Irish English. As an example, I've prepared the following reading of a quote from the Declaration of Independence in Colonial English. wi hold ðiz truθs tu bi sɛlf ɛvɪdɛnt, ðæt ɔl mɛn ær krietɪd ikwəl, ðæt ðe er ɪndɔud bʌi ðer krietər wɪθ sərten ʌnelienəbl rəits, ðæt əməŋ ðiz er lʌif, libərtɪ, ænd ðə pərsut ɔv hæpɪnɛs. I've also added the explicit version as a lyric video on YouTube. The IPA is included here! Although British visitors to the colonies noted its "purity" of speech and "lack of idiom or tone", it seems unlikely that everyone in the colonies spoke the same variety. We know that certain parts of the colonies were settled by certain groups. It makes sense that those groups would bring the features of their particular region of Britain to America. Wells (1982) estimates that British English and American English had shared developments until 1750, when both varieties started to develop apart from one another. It also makes sense that, since travel between the colonies was rather difficult and the distance between them rather large, that they would begin to develop separately from each other. There is some evidence for dialectal division when you look at runaway slave advertisements, which often described slaves on the basis of their accents. We have instances of slaves being identified as being "from Maryland or Virginia," having a "New England accent," and a "West Indies" accent, which suggests that these were distinct and recognizable varieties. Due to the paucity of information on other Colonial English dialectal regions, we're going to be looking at New England and the South. New England is the best-documented region of the early colonial period with regards to early dialectal variation. There were a lot of documents written by semi-literate people, and their naive spellings show some divergent features (Bailey 2015:29). Such a tradition was not strong in the Middle or Southern colonies, where documents were written in the standard English of the time, so it's harder to determine dialectal variation there (Krapp 1925). There's evidence for non-rhoticity. It seemed to have existed alongside rhotic pronunciations, with some variation: "horse" was often written "hoss," and "George" was sometimes written "Geoge" (Bailey 2015:40). Bostonian Benjamin Franklin seemed to have used a rhotic pronunciation; his description of the 'r' sound in English in particular suggests a trilled 'r', and he does not drop the 'r' in his transcriptions. Franklin's transcription does not include a way to represent the sound we now have in "father"; words like "father" rhymed with "gather" and "rather" for him. However, there were signs of what is called TRAP-BATH split in Boston. This means that words like "trap" were pronounced with /æ/ and words like "bath" were pronounced with /ɑ/. It's possible that the broad 'ah' sound was in circulation, but it had not been established as a separate phoneme in all varieties of English (Krapp 1925). First of all, Southern American accents as we know them did not exist. Many of the features we associate with the South are actually rather recent. For example, pronouncing 'ride' like 'rad' was not something that happened in the 1700s - it probably began in the mid to late 1800s (Bailey 1997,Source 1,Source 2, Labov, 2016). Some other features, like rhyming "pen" and "pin," may have started in the early twentieth century (Brown, 1991). This means an eighteenth century Southern accent would not sound like a twenty-first century Southern accent. Don't take this to mean that there weren't nascent difference between the South and the rest of the country, though! Many of these differences have simply disappeared since. For example, a lot of words that are pronounced -eer /ir/ in modern English were historically pronounced /ɛr/ or /ær/ (Primer, 1887:90). For example, Thomas Jefferson seemed to rhyme "tear" (salt water from our eyes) with "care," meaning "tear" was likely pronounced something like [tɛr]. It's possible that this feature was also present in some other regions of the colonies. The poet Phyllis Wheatley was born in Africa in 1753, and sold as a slave to Boston merchants. Although her variety of English was probably influenced by Boston, note how she rhymes "war" and "air" in the poem below. Knowing that "war" would have been /wær/ at the time, this means it's likely she pronounced "air" as /ær/. There's another phenomenon that is typical of very conservative Southern speech - palatal stops in words like "garden" and "cart" [kɑrt] so that they sound like "gyarden" and "cyart" [cart]. We may not have direct evidence for it in the 1700s, but it seems to have already existed by the 1800s, and is in decline by the 1900s. We know at some point, big hub cities (most famously Charleston in South Carolina) in the south tended towards non-rhoticity (Mencken). Bailey (2015) reports that Virginians spoke non-rhotically. This feature later became emblematic of coastal Southern speech, and is moribund nowadays. Now let's look at everything other than pronunciation. For the most part the morphology, lexicon, and spelling of Colonial English should still be recognizable to the modern American. However, that doesn't mean that you won't find notable differences here! The differences here are a lot less systematic than the sound ones. Some of these differences are mostly used by a single Founding Father, while others are more varied. This simply reflects the fact that Colonial American English was fluctuating and, moreover, not yet standardized. Most verbs in English need a "do" if you want to form a negative: "I do not/don't care," "I do not/don't know," "I did not/didn't need..." etc. Only a handful of verbs can form negatives without "do" such as "to be" ("I am not") and, in some varieties of English, "to have" ("I had not"). Making negatives without "do-support" is much more common in the past. "I know not" is still in common use, though now in variation with "I don't know." Occasionally other verbs are also negated with "not" directly. Standard verb forms are not set in stone (Krapp 261). You'll see the founding fathers use forms that nowadays would be considered non-standard. This is dialectal variation, not an "incorrect" form. V2 word order is a type of word order where the verb must come after the first constituent in a sentence. Modern English does not have V2 word order and instead has Subject-Verb-Object word order, meaning the verb must come after the subject. However, Old and Middle English had V2 word order, which began to disappear over time. There are remnants of this in Early Modern English and Colonial American English. The Modern English versions would be "In the afternoon, a cloud came up of thunder and lightning" and "Whatever deficiencies there may be in them as to that matter, I hope will be supplied by the extract now enclosed." A ditransitive verb is a verb that accepts a direct object and an indirect object. For example, in "She sent me a horse" the direct object is "horse," because that is the thing being sent, and the indirect object is "me," because it is the direction of the thing being sent. If we wanted to turn this into a passive construction, we would have to say "A horse was sent to me." However, this "to" does not seem necessary in 1700s English, as shown by John Adams's quote below. In a sentence like "John wanted her to leave," it is interesting to note that "her" is not actually the semantic object of "wanted." What John wanted was not "her." What John wanted was her leaving. "Her" is actually the subject of "to leave." Some verbs in English allow for this sort of construction. Nowadays we don't really see this with the verb "to wish," but it seems to have existed in colonial American times. One of the more interesting verb differences is that you can find examples of things like "I am come" instead of "I have come." This is preserving a distinction that used to exist in English - the difference between unergative and unaccusative verbs. Unergative verbs are verbs which describe actions that the speaker voluntarily started, like "I ran," "I jumped." Unaccusative verbs are verbs where the subject did not start the action themselves. These are verbs like "John died," "the vase broke," "Mary arrived." These are more like things that happen to the subject. In 1700s English, unaccusative verbs are marked by using "to be" as an auxiliary verb instead of "to have." This means you have examples like "I am fallen," "I am arrived" in the Founding Fathers' texts. This distinction still exists in French: je suis tombe vs j'ai travaille (I fell vs I worked). Nowadays most English speakers will only encounter this construction in the King James Version of the Bible with "Jesus is risen." The subjunctive form was used a lot more often, especially by Thomas Jefferson. It's worth noting that the founding fathers were learned men, and their writing likely was not an exact reflection of their speech. Some words that aren't in currency anymore are still being used at the time, such as methinks. Spelling was also in flux. Honor vs honour, college vs colledge, public vs publick. This is clearest in the Constitution, where Pennsylvania is spelled "Pensylvania" (one n at the beginning). This isn't Hamilton making a typo - the spelling had not yet been settled. This is especially bad with commas and punctuation. Thomas Jefferson is fond of using commas where nowadays we would prefer a semi-colon or even just a period. As was noted in the introduction, Colonial American English and eighteenth century English are woefully understudied. There were further points I was interested in researching, but was unable to find sufficient writings for. One was the extent to which dialectal differences from British English dialects affected the formation of Colonial American English. A paper I am unfortunately no longer able to locate suggested that almost all the settlers must have been from Southern England, since all American dialects have the PUT-STRUT split and most Northern English dialects do not. I wanted to include more comparisons to eighteenth century English English, but had to scrap this due to time concerns. A more in-depth study would mention that there were far too many lexical differences to include, and perhaps go more into detail about aspects beyond phonology. Finally, this article focused on just the first half of the 1700s. However, there is evidence that a distinct Colonial American English was already emerging in the 1600s. In other words, anyone interested in expanding on this field has plenty of room to look in. Colonial American English represents a fascinating point in between Elizabethan English and our modern varieties of English. Although the primary point of this article is to note how American English has changed from colonial times to modern times, there are also many points of comparison with varieties of British English. Some of the distinctions that no longer exist in American English are still being made in Received Pronunciation, and some of the distinctions made in Colonial American English aren't being made at all anywhere! It's a wonderful example of how language is constantly changing. The change is not always radical, but over centuries it adds up so that we don't have an accurate understanding of what the American Founding Fathers would have sounded like in the popular imagination. Bailey, Guy. 1997. When Did Southern American English Begin? In Englishes around the World: Vol.1: General Studies,British Isles,North America: Studies in Honour of Manfred Görlach, edited by Edgar W. Schneider. Amsterdam:John Benjamins. Bailey, Richard W. 2015. Speaking American: a History of English in the United States. Oxford Univ. Press. Beal, Joan C. English Pronunciation in the Eighteenth Century: Thomas Spences Grand Repository of the English Language. Oxford University Press, 2002. Brown, Vivian R. 1991. "Evolution of the Merger of /I/ and /ε/ before Nasals in Tennessee" in American Speech Vol. 66, No. 3 (Autumn, 1991), pp. 303-315. Labov, William. 2016. "The Beginnings of the Southern Shift" in Linguistic Variation: Confronting Fact and Theory edited by Rena Torres Cacoullos, Nathalie Dion, André Lapierre. Franklin, Benjamin. 1907. The writings of Benjamin Franklin. New York: The Macmillan company. Krapp, George Philip. 1925. The English Language in America. Century Co.
Mencken, Henry Louis. 1919. The American Language. Primer, Sylvester. 1887. Charleston Provincialisms. Transactions and Proceedings of the Modern Language Association of America.